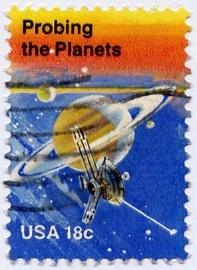 This stamp was produced to commemorate the Pioneer missions. Pioneers 6, 7, 8, and 9 were created to make the first comprehensive measurements of the solar wind, solar magnetic field and cosmic rays. Designed to measure large scale magnetic phenomena and particles and fields in interplanetary space, data from the spacecraft was used to better understand stellar processes as well as the structure and flow of the solar wind. The four spacecraft also acted as the worlds first space-based solar weather network, providing warning of solar storms which impact communications and power on Earth. During the Apollo lunar landings, NASA used the fleet of Pioneers to provide hourly updates on the Suns activity to Mission Control in Houston. Their data guarded against the otherwise unexpected blast of intense showers of solar protons that could have endangered the lives of astronauts. The four spacecraft, spin stabilised at 60 revolutions per minute, were launched into Solar orbits between 1965 and 1968. After their prime mission to study the Suns environment was completed, the spacecraft were then tracked only occasionally. Pioneer 6 was launched on 16 December 1965, one day after the successful Gemini VI/VII rendezvous. Some time after 15 December 1995 (30 years after it was launched) the primary transmitter (TWT) failed. During a track on 11 July 1996 the spacecraft was commanded to switch to the backup TWT, and the downlink signal was re-acquired. The spacecraft and a few of the science instruments were again functioning. Pioneer 6 holds the record for the longest active spacecraft when Goldstone managed to lock on to its signal for about two hours on 8 December 2000 to commemorate its 35th anniversary. Pioneer 8 was launched on 13 December 1967. Its primary transmitter (TWT) failed several years ago, but on 22 August 1996 the spacecraft was commanded to switch to the backup TWT, and the downlink signal was re-acquired. The spacecraft and one of the science instruments were again functioning. From memory Honeysuckle Creek did track these spacecraft at various times. We tracked Pioneers 10 and 11 for many hours, particularly from 1974 when we joined the Deep Space Network until we closed down in 1981. Tidbinbilla continued tracking them until they ran out of consumables and began to drift. In these days of sophisticated technology and high speed computers it is interesting to note that between 1964 to 1968 the spacecraft real-time data from the tracking stations was sent by teletype to twenty machines clattering away producing octal codes with a group of operators standing by converting the coded data with slide rules to plot the results. By the time Pioneer 10 appeared on the scene they had Xerox Sigma 5 computers generating the engineering and scientific data for the displays and recording on magnetic tapes. The first public discussion of a mission to the gas giant Jupiter was a press release on Thursday, 7 May 1970, just 10 months after Apollo 11 had landed on the Moon. Two spacecraft were to be designed specially for the project and joined the Pioneer series of spacecraft, initially designated Pioneers F and G.
Will these spacecraft be able to look at the solar wind outside the ecliptic plane? Can these Pioneers reach space beyond the limits of the Suns solar wind? Will fifteen times the distance from the Sun represent the limit of communication with the Pioneers? What were the chances of the two spacecraft getting through the asteroid belt? A flight over the poles of Jupiter was considered so Pioneer might be able to look deeper down into the hydrogen gas ball, but was abandoned for the first Pioneer, which was to be targeted at the radiation belts believed to be concentrated about the equatorial regions. Before these spacecraft could be launched, it was estimated fifteen million man-hours would be required, spread over 2½ years. With an extended mission it was realised that mission scientists would be spending 10 years or more dedicated to the experiments, a whole new concept for the times. The twins Pioneer 10 and 11 had a new role to perform  they were to be the first human artefacts to visit the gas giants and leave the solar system to enter intragalactic space. As these were the first spacecraft to be heading away from the Sun, they had to be lightweight, have a communications system designed for extreme distances, and could not rely on solar panels for power, so carried Radioisotope Thermal Generators (RTG) power supplies. Pioneer 10 was the trailblazer, and Pioneer 11 was the backup in case of any failures, so was initially targeted to follow the same trajectory as Pioneer 10. 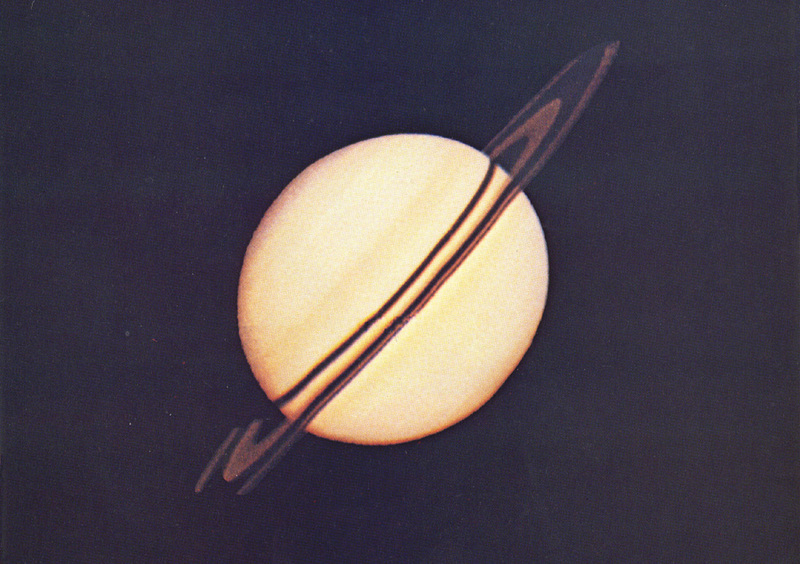 If Pioneer 10 was successful, Pioneer 11 had the capability and time enough to be retargeted to achieve a separate mission, which could include the planet Saturn. Pioneers F and G were built by TRW Inc., Redondo Beach, California. After delays due to weather and a launch pad power failure, Pioneer F was launched on 2 March 1972 at 2049 USEST (1249 AEDT on 3 March) on a three-stage Atlas-Centaur rocket. It left the Earth on a direct ascent trajectory, i.e. it did not go into a parking orbit first. Distant lightning and thunder applauded the launch of this trailblazing spacecraft. 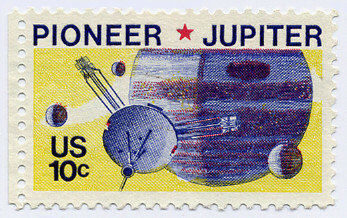 On launch, Pioneer F became Pioneer 10 and reached the speed of 52,140 kilometres per hour needed for the flight to Jupiter, making it the fastest human-made object to leave the Earth; fast enough to pass the Moon in 11 hours (Apollo took 3 days) and to cross Mars orbit, about 80.5 million kilometres away, in just 12 weeks, on 25 May 1972. These Pioneers were designed to spin steadily along their trajectory at 4.8 rpm, the dish antennas always pointing at Earth. The first mid-course correction on 7 March 1972 set up the spacecraft to meet all the Jupiter fly-by objectives except for a passage behind the moon Io. At this stage in the flight an Io analysis was not guaranteed due to the effects of solar radiation on the spacecraft, and the location of Jupiter and its moons were not known precisely, but a slight course adjustment on 19 September set up an Io occultation and moved the arrival time 17.2 minutes earlier. A second manoeuvre on 24 March was designed to delay the arrival time of the spacecraft by 2½ hours and move the arrival point 12,575 kilometres closer to the planet. It was now expected Pioneer 10 would encounter the planet 14° below the equator and skim 140,000 kilometres above the cloud tops. At this point 10 of the 11 instruments were powered up and sending valid data, only the Trapped Radiation Detector was left off as it was only to be used to record Jupiters heat emissions. The meteoroid detector had recorded 10 impacts and the asteroid-meteoroid telescope had spotted only one meteoroid. At that time data rates to the tracking stations varied between 512 to 2048 bits per second. 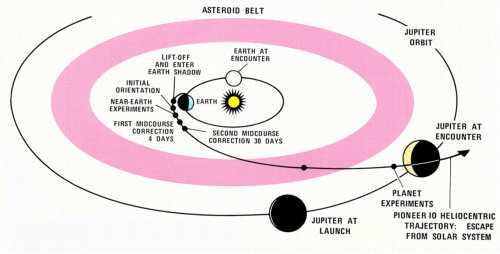 The path of the trailblazing spacecraft Pioneer 10 out to Jupiter through the asteroid belt. The mission consisted of several phases of spacecraft operations: near launch, interplanetary, encounter, and post-encounter cruise. The first unknown, where there was every chance the spacecraft would hit something, was the asteroid belt. It is estimated to contain 50,000 asteroids of 1 kilometre or more in diameter, with the largest, Ceres, a 1,000 kilometre wide asteroid discovered in 1801. On 15 July 1972 Pioneer 10 entered the asteroid belt, a doughnut-shaped area that measures some 281 million kilometres across and 80 million kilometres thick. The material in the belt travels at speeds up to 72,000 kilometres per hour and ranges in size from dust particles to rock chunks as big as Alaska. Here, a speck of dust of only 0.5 millimetre colliding with the spacecraft could cripple it, but the scientists had calculated there was a 90% chance of getting through unscathed. Pioneer 10 was the first spacecraft ever to pass through the asteroid belt. Pioneer 10s closest approach to any known asteroid was just under 9 million kilometres of a 1 kilometre diameter chunk of rock on 2 August, and another at a similar distance was Nike, a 24 kilometre wide asteroid, on 2 December 1972. 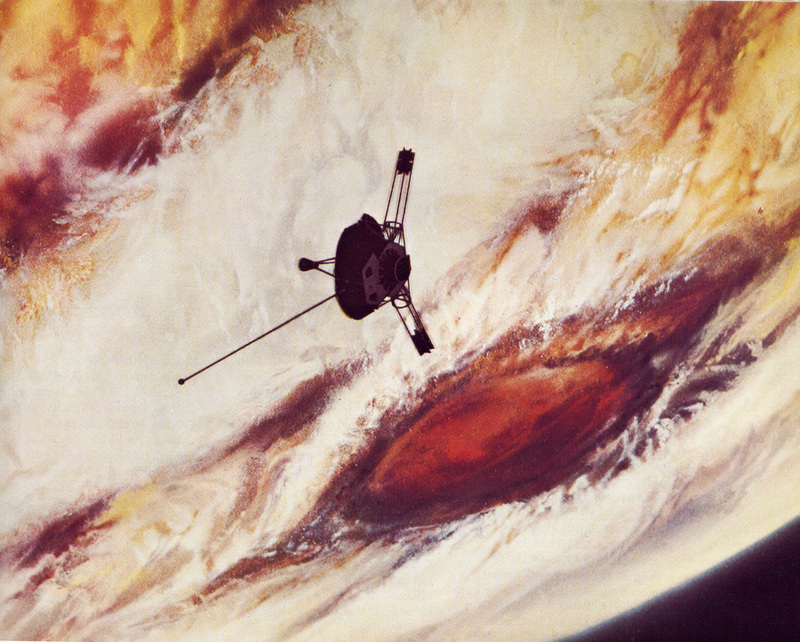 To the relief of the scientists Pioneer 10 emerged safely from the asteroid belt on 15 February 1973. During August 1972 the Sun generated three enormous storms on the 2nd and another on the 7th, so powerful the effects warped the Earths magnetic field and caused power and communications blackouts in Alaska, Canada, some of the northern areas of the United States, and Sweden. At the time Pioneer 10 was still coasting through the asteroid belt, so scientists were able to correlate measurements of the distant Pioneer 10 with Pioneers 6 through 9 in orbit around the Sun. 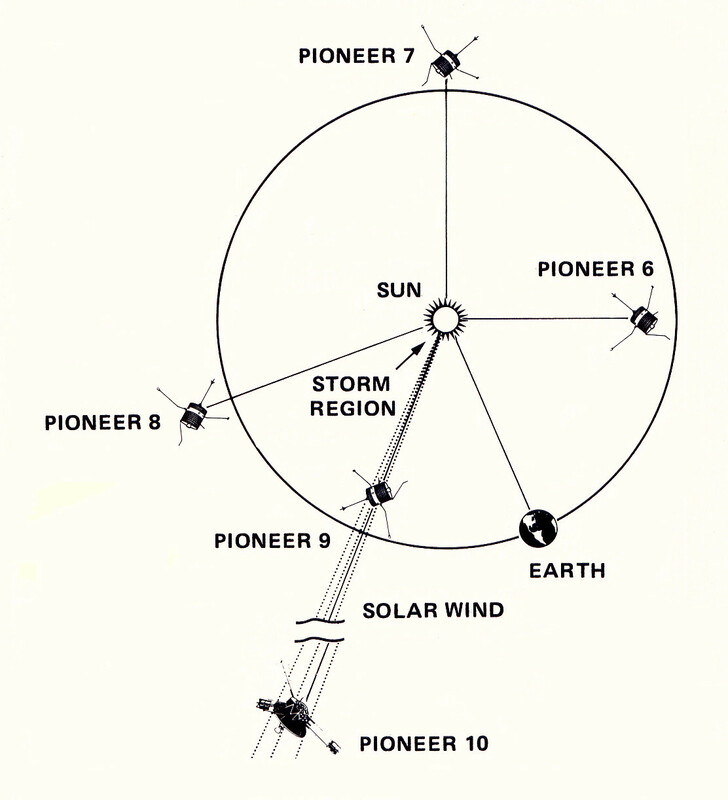 Pioneer 9, close to Earth, measured the highest solar wind speeds ever recorded at the time at 3,597,000 kilometres per hour. By the time this solar wind had reached Pioneer 10, 76 hours later, the wind had slowed to half this velocity. 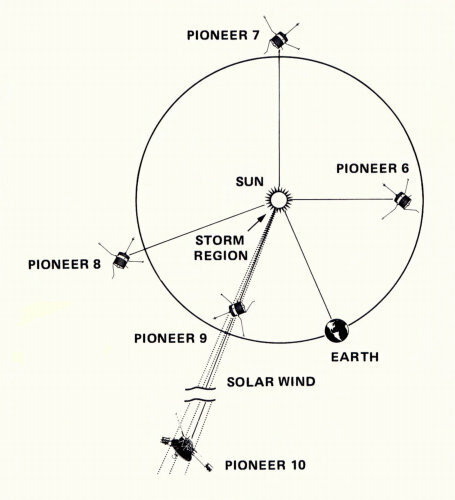 Pioneer 10, operating in conjunction with Pioneers 69 spread around the Suns local environment, observed the distribution of the solar wind from flares and how its characteristics change with increasing distance from the Sun. Approaching Jupiter early in November 1973 the flight controllers faced the busiest period of the Pioneer 10 flight, beginning with long range imaging tests on the planet on 6 November, the spacecraft taking the first pictures of the planet. It crossed the orbit of Jupiters outermost moon, Sinope, 23.7 million kilometres from the planet on 8 November to begin the 60-day encounter period. At 0600 AEDT 27 November Pioneer 10 plunged through Jupiters bow shock wave much earlier than expected, 6.4 million kilometres from the planet. Surprised scientists found that Jupiters magnetic field was inverted  that the magnetic north was at the planets South Pole, and that it was wobbling up and down. Up to that point the solar wind was travelling past the spacecraft at 451 kilometres per second, but after crossing the shock wave it dropped to 225 kilometres per second while its temperature rose 450,000 degrees. The spacecraft did not actually experience this temperature, because it was a highly rarefied plasma unable to transfer significant quantities of heat to the spacecraft. Exactly a day later the spacecraft crossed the boundary between the shocked solar wind and the magnetic field of Jupiter, called the magnetopause, where the pressure of the solar wind becomes equal to the pressure of the planets magnetic field, and the gas contained within that field, so the solar wind effectively stopped at this point. From this point Charles Hall, the Pioneer Project manager, wanted to keep the mission briefings short, so he insisted that the attendees should stand during the meetings. Although it was an unorthodox method, it worked, the meetings lasting a maximum of two hours. By 2 December, after crossing the orbit of Callisto, the images being sent back were exceeding the detail of the best pictures ever taken from Earth based telescopes. Tension mounted among the flight controllers and scientists as Pioneer 10 penetrated deeper into the radiation belts of x-rays and gamma rays around the planets equator  measuring instruments began soaring to their upper limits. By about 1000 the instruments were saturated with the radiation and gave up the ghost, and the scientists realised that the radiation was reaching 10 times the expected levels. As the energy versus the distance to the planet plot was going straight up, it looked as though the spacecraft was doomed. Charlie Hall felt he was walking into a funeral parlour when he entered the operations room. Mournful TRW engineers announced that the spacecraft looked as though it was about to go off the air. Then, to their surprise, before the spacecraft reached PCA (Point of Closest Approach) the readings began to register again. It appeared the intense radiation belts had risen above the spacecraft at this critical moment due to the wobble about the equator and Pioneer 10 was saved. All the instruments recovered except the optics and photomultipliers in the Sisyphus, which were destroyed by the radiation. 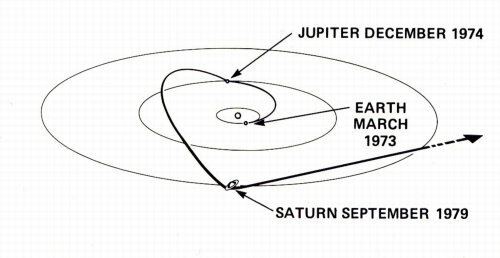 Pioneer 10 maintained an almost constant view relative to Jupiter for several hours during the closest approach because its direction of travel was the same as the rotation of Jupiter. Honeysuckle Creek was busy with Skylab III when Pioneer 10 encountered Jupiter, and would have tracked Pioneer 10 during the Skylab down periods, sending the data across the microwave link to Tidbinbilla. Pioneer 10 made its PCA one minute ahead of the planned time at 1825:19 USPST on 3 December (1325:19 AEDT on 4 December) 1973, passing 130,350 kilometres, or 2.86 Jupiter radii (Rj), above the cloud-tops at a speed of 132,000 kilometres per hour. The spacecraft had speeded up slightly above the calculated speed because Jupiter turned out to be heavier than calculated from Earth-based observations. Then came the passage behind the planet, when the signal was cut off for just over an hour. It was nail-biting time for the engineers and scientists, waiting for the signal to reappear. To pass the time bets were laid whether the spacecraft would survive or not. To their relief, at the appointed moment a picture began to appear, pixel by pixel, until they were watching something that had never been seen before  a crescent sunrise at Jupiter. Pioneer 10 had fulfilled its mission. Artists impression of Pioneer passing over the Great Red Spot at Jupiter. During this period up to 2,000 commands per day were being sent to the spacecraft by teams working around the clock at mission control in the Ames Research Center. 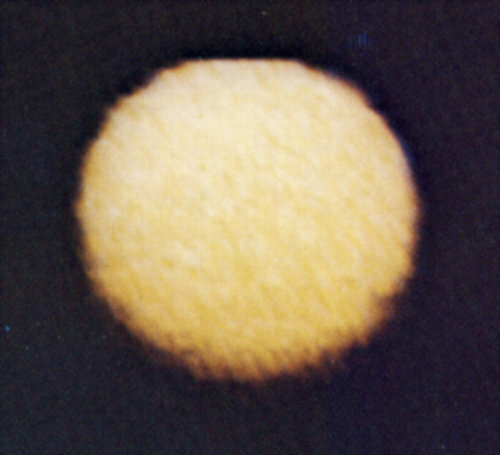 Of all the planned scientific objectives, only the close-up imaging of Io was missed due to the intense radiation fields interfering with the transmitted commands. Two of the cosmic ray detectors saturated two days before PCA, but the scientists had anticipated this, and added a special Jovian radiation belt detector, which picked up protons in the radiation environment for the first time. Dr. Colleen Hartman, director of NASAs Solar System Exploration Division, NASA Headquarters, Washington, announced, "Pioneer 10 was a pioneer in the true sense of the word. After it passed Mars on its long journey into deep space, it was venturing into places where nothing built by humanity had ever gone before. It ranks among the most historic as well as the most scientifically rich exploration missions ever undertaken," she said. As DSS41 at Island Lagoon had closed down in December 1972, only Tidbinbilla was involved with these trailblazing events in Australia. At Honeysuckle Creek we were still with Manned Space Flight tracking the third Skylab crew during this period, so only participated when we had down periods when Skylab was out of range. During the passage by Jupiter, Pioneer 10 obtained the first close-up images of the planet, charted Jupiters intense radiation belts, located the planets magnetic field, and discovered that Jupiter is predominantly a liquid planet. Once Pioneer 10 was safely past Jupiter, the data was analysed and all the information sources such as observatories and encyclopaedias had to be updated to reflect the new information. At PCA the surface resolution was 200 kilometres, which was five times better than Earth based observations. Scientists decided Jupiters weather circulation seems to be relatively local (in the polar regions), or to flow principally around the planet (in the equatorial regions). The infrared radiometer measured the temperature of the dark side (not visible from Earth as we only see one face of the planet), and found there was little difference between the dark and light sides of the planet. It seems to be heated uniformly from the poles to the equator, a major discovery. Most atmospheric features on Jupiter seem to have a life of decades with organised structures unknown on Earth. Helium, not detectable from Earth, was positively identified in the Jovian atmosphere for the first time by the Ultraviolet Photometer. Pioneer 10 found the atmosphere mainly consists of hydrogen, helium, ammonia, methane, plus small quantities of deuterium, acetylene and ethylene. After closest approach and sailing out of the other side of the planet, Pioneer 10 sent views never seen from Earth, such as sunrise on a crescent shaped planet. The contrast was less in the crescent phase because of the way the cloud particles scatter light. 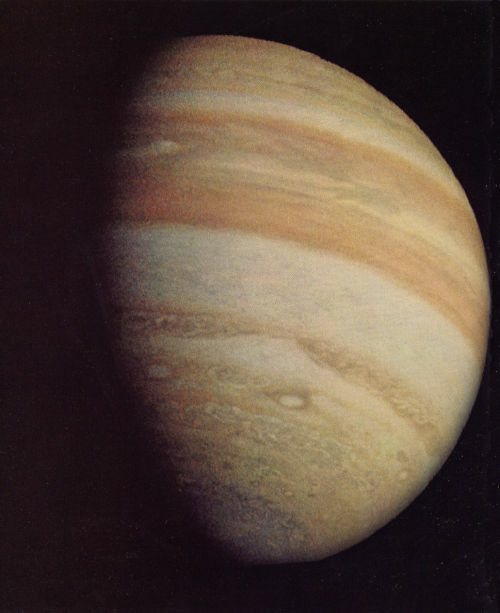 The last picture of Jupiter taken by Pioneer 10 was taken on New Years Eve, 1973. After crossing over Saturns orbit, Pioneer 10 plunged into Jupiters enormous magnetic tail for 24 hours. Streaming away from the Sun, it stretches at least 690 million kilometres into space, past the orbit of Saturn. This means that Saturn should pass through Jupiters tail every 20 years. In 1983 Pioneer 10 became the first human-made object to pass the orbit of Pluto, the most distant planet from the Sun. Following that crossing, the remarkable little spacecraft explored the outer regions of the Solar System, studying energetic particles from the Sun (solar wind), and cosmic rays entering our portion of the Milky Way. The spacecraft continued on, making valuable scientific investigations in the outer regions of the solar system until its science mission ended in the month of March 1997. Famed as the most remote object ever made by man until 17 February 1998, the heliocentric radial distance of Pioneer 10 had been greater than that of any other manmade object. But on that date Voyager 1s heliocentric radial distance equalled that of Pioneer 10 at 69.419 AU. Thereafter, Voyager 1s distance will exceed that of Pioneer 10 at the approximate rate of 1 AU per year. On Friday 27 April 2001 scientists sent a signal to Pioneer 10 through Goldstone. Twenty-two hours later, at 0327:30 AEST Sunday, DSS63 Madrid received a signal from Pioneer 10, the first time since August 5/6 of the previous year. They had been listening for the Pioneer 10 signal in a one-way downlink non-coherent mode since the previous summer with no success. When they changed to a two-way coherent mode they managed to lock onto the spacecraft, so it appeared that Pioneer 10 still had a life, but only in a two-way coherent mode. They found the Geiger Tube Telescope instrument was still powered up. Due to power considerations, this was the only instrument that has been powered on for the last 4 years. The scientific data on the 5 and 6 August 2000 tracks of Pioneer 10 were analysed by Dr. Van Allen, who reported clean data. Based on the previous data received, Van Allen concluded that galactic cosmic radiation was still being moderated by the Suns influence, meaning Pioneer 10 has not yet crossed the boundary into interstellar space. After more than 30 years, it appears the venerable Pioneer 10 spacecraft had sent its last signal to Earth from a distance of 12.2 billion kilometres. Only a very weak signal was received on 22 January 2003. Data rates at the end of these two Pioneer missions dropped to 16 bits per minute. NASA flight engineers report Pioneer 10s radioisotope power source had decayed, and it may not have enough power to send additional transmissions to Earth. The Deep Space Network did not detect a signal during the last contact attempt on 7 February 2003. The previous three contacts, including the 22 January signal, were very faint with no telemetry received. The last time a Pioneer 10 contact returned telemetry data was 27 April 2002. NASA has no additional contact attempts planned for Pioneer 10. At last contact, Pioneer 10 was 12 billion kilometres from Earth, or 82 times the nominal distance between the Sun and the Earth. At that distance, it takes more than 11 hours and 20 minutes for the radio signal, travelling at the speed of light, to reach the Earth. Originally designed for a 21-month mission, Pioneer 10 lasted more than 30 years. It was a workhorse that far exceeded its warranty, and I guess you could say we got our moneys worth, said Pioneer 10 Project Manager, Dr. Larry Lasher. Pioneer 10 will continue to coast silently through interstellar space, heading generally for the red star Aldebaran, which forms the eye of the constellation Taurus (The Bull). About 68 light-years from Earth, it will take Pioneer 10 more than two million isolated years to reach it. Pioneer G was launched at 2111 USEST on 5 April (1211 AEST 6 April) 1973 to become Pioneer 11. There were a few tense moments after separation when the spacecraft was spinning too fast due to one of the RTG booms failing to deploy to its fullest extent. Thrusters were fired to try and jar the spacecraft to shake the boom out. Combined with the spacecraft reorientation for minimum solar heating, the boom fully extended and the spin rate dropped to the designed 4.8 rpm and the spacecraft proceeded on its way with all systems GO. With the success of the Pioneer 10 fly-by of Jupiter, Pioneer 11 could now be targeted for the alternate mission to Saturn. Debates raged on where Pioneer 11 should pass by Jupiter. Scientists Simpson and Van Allen wanted more information on the Jovian magnetic fields and charged particles trapped within them, so Pioneer 11 was targeted to go in closer. However, after Pioneer 10s narrow escape, to go in closer would seem suicidal. So a different path was chosen, to go faster and under the south pole of Jupiter and hope to avoid the concentrated fields around the equator. Once safely through the Asteroid belt (between 20 March to 19 April 1974), the Pioneer 11 thrusters were fired at 0200 AEST on 20 April to add another 229 kilometres per hour to the spacecrafts velocity to aim the spacecraft to skim 43,000 kilometres above Jupiters cloud tops, and head for Saturn. This close approach also allowed the spacecraft to be accelerated by Jupiter to a velocity of 173,000 kilometres per hour so that it would be carried high over the Solar System, covering some 2.4 billion kilometres to Saturn. One of the main objectives of the mission was to penetrate deeper than Pioneer 10 into the radiation belts  to go in three times closer to the planet. Its trajectory had been selected to approach Jupiter from below the south pole so it would be well away from the intense radiation belts concentrated at the equator, to minimise the exposure to the intense radiation. 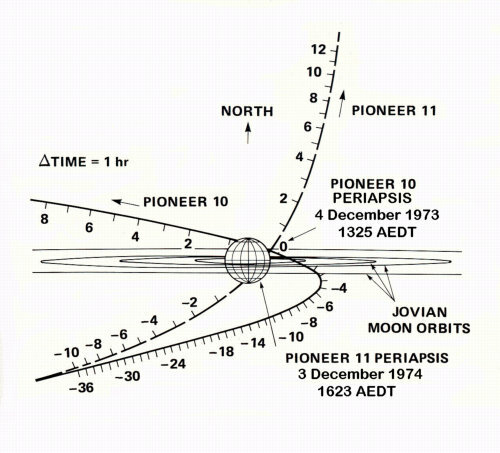 As with Pioneer 10, the encounter was conducted in 5 phases, the First Phase beginning on 3 November 1974 at 24 million kilometres from the planet. The Second Phase began with the bow shock wave about 10 million kilometres out on 26 November at 0500 AEDT. The Third Phase was when Pioneer 11 continued flying through the outer magnetosphere from 4.8 to 3.2 million kilometres from the planet. Phase Four covered the day before and after PCA, while in Phase Five Pioneer 11 headed away from the planet, repeating many of the experiments in reverse sequence. 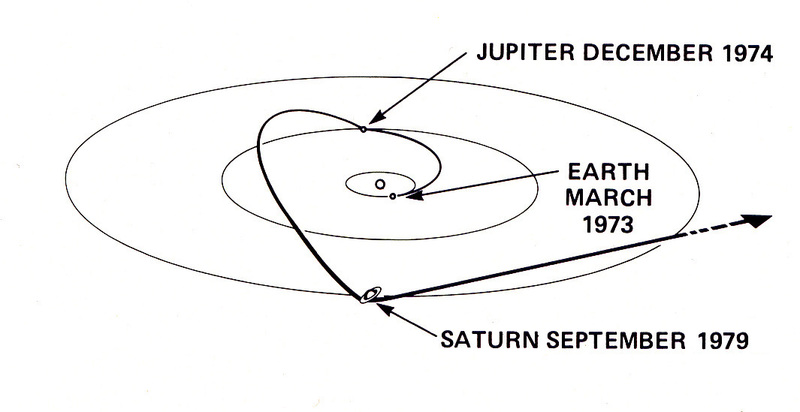 Pioneer 11 crossed the orbit of Sinope, the Jupiters outermost moon on 7 November 1974 and entered the Jovian system. This system is so large that, despite Pioneer 11s tremendous speed, it wasnt until 1 December, the day before closest approach, that the spacecraft began to cross the orbits of the large Galilean satellites, with no really close approaches to any of them. An excellent image of the Great Red Spot was only obtained by a quick revision of the command sequences, as it was mandatory for the timing of a close-up image of the spot to be extremely precise. One day before PCA a malfunction caused by radiation affected the stepping function of the telescope so a few images were partially lost before a workaround could be implemented. Pioneer 11s views of the planet were quite different to Pioneer 10, because its direction of travel was the opposite to the rotation of Jupiter, travelling a full circle of longitude of the planet during its observations in the four hours around periapsis. This is a good picture of the Great Red Spot taken at 0223 AEDT on 3 December 1974 by Pioneer 11 just 14 hours before PCA. At this point Australia provided some drama with a 6 hour strike of diesel operators at Tidbinbilla only a few hours before PCA, which put the mission in jeopardy because Mission Control had lost confidence that Tidbinbilla would track through the encounter, though in the end they did. Within thirty minutes they reprogrammed the encounter sequence so Goldstone could cover the encounter until the spacecraft set, which also meant the bit rate had to be dropped from 2048 to 1024 bits per second. By this time Honeysuckle Creek had joined the Deep Space Network so was tracking one way during the encounter phases of both Jupiter and Saturn. Pioneer 11 went behind the giant planet at 1602 AEDT on Tuesday 3 December 1974 just 21 minutes before PCA, skimming 43,000 kilometres above the cloud tops. It suffered intense radiation as it barrelled past the massive planet at a speed of 173,000 kilometres per hour. Tension reached breaking point  would this speck of Earths technology survive the unknown hazards, or be overwhelmed by the extreme conditions? Jupiter is a powerful planet and Pioneer 11 was three times closer than Pioneer 10 and treading a different path. The waiting was unbearable, specially waiting 40 minutes for the signal to travel the distance to the Earth. At 1724 AEDT Tidbinbilla sensed a faint signal, followed by Goldstone ten seconds later, and it was soon apparent the spacecraft had survived the ordeal, but not without some anomalies in the plasma analyser, infrared radiometer, meteoroid detector and imaging photpolarimeter. 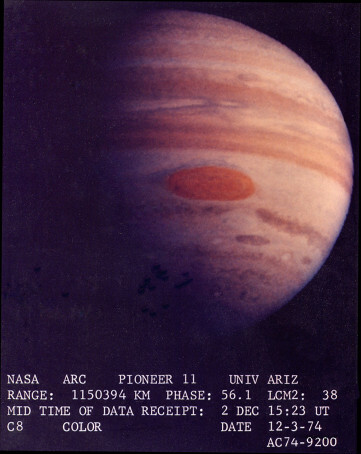 As with Pioneer 10, spurious commands were issued, this time affecting the infrared radiometer more than the imaging system, causing the radiometer to miss observing some of the northern hemisphere of Jupiter, though this was corrected as soon it was detected. The spacecraft flew under the south polar region of Jupiter, an area never seen from Earth, and found the cloud tops were substantially lower at the poles than at the equator. Blue sky was observed at the pole, suspected to be multiple molecule scattering of light by gases of the transparent atmosphere at Jupiters poles. The pictures sent by Pioneer 11 were broadcast live over cable TV in the San Francisco Bay area, and to several public halls. People crowded in the halls listened to a running commentary by Apollo 15 astronaut Al Worden. Due to the spacecrafts speed and closeness to the cloud-tops no pictures could be obtained of the planets surface during the actual fly-by at PCA. Of Jupiters moons, Pioneer 11 took the only good image of Io, from over its north pole, and Pioneer 10 took the only image of Europa. Both spacecraft recorded reasonably good images of Ganymede and Callisto. During its flyby of Jupiter on 2 December 1974, Pioneer 11 obtained dramatic images of the Great Red Spot, made the first observation of the immense polar regions, and determined the mass of Jupiters moon, Callisto. 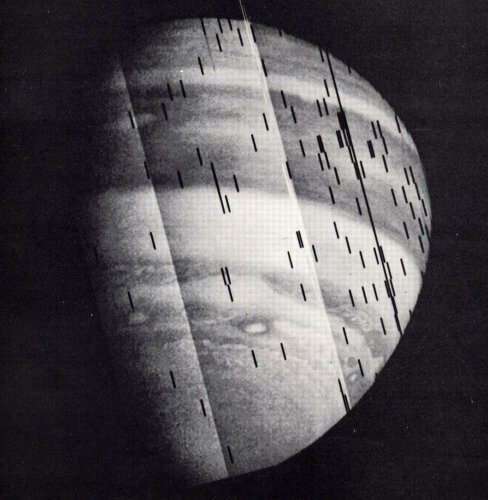 Between 18 November and 9 December Pioneer 11 sent 460 images of Jupiter and its moons. The picture on the left shows the picture of the blue channel data exactly as it was received at the Ames Research Center, without any computer corrections or enhancement. Four computer corrections were applied to get the finished image on the right. 1. The first correction applied was to fix the shape of the planet, distorted by the spacecrafts motion and viewing geometry. 2. The three bands of varying image intensity, a consequence of maximising the scientific value of the data for photometric analysis of the clouds, were evened out. 3. The black strips of missing data, caused by problems at the receiving station, were filled in by interpolating the neighbouring values. 4. Two rolls of unsynchronised spacecraft data were, seen as diagonal lines, were repositioned. 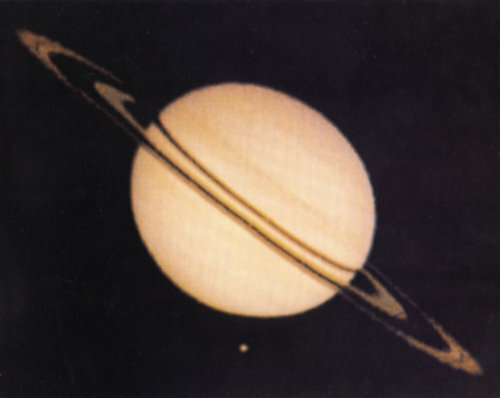 As soon as Pioneer 11 had passed out of the Jovian environment it was renamed Pioneer Saturn. This diagram illustrates the comparison of Pioneer 10 and 11 paths during their encounters with Jupiter as viewed from Earth. The hourly time marks show the count down to, and the count up after periapsis. On hearing about these observations, at first JPL scientists decided to keep Pioneer 11 well clear of the rings. Pioneer 11, Voyager, and Cassini have proved these deductions were not accurate. During 30 June 2004 the spacecraft Cassini took a chance and flew between the F and G rings at 87,300 kilometres per hour, recording about 100,000 hits. As most of the particles were only 1 micrometre, the biggest about 100 times larger, no damage was done to the spacecraft. Cassini also confirmed that the rings consist of at least 90% water ice, and showed that the particle size increased with distance from the planet. A few weeks after leaving Jupiter, mission controllers were puzzled by erroneous commands being generated within the spacecraft. Diagnostics pointed to the Sisyphus asteroid-meteoroid detector, irreparably damaged by the radiation at Jupiter, as the culprit, so it was turned off and the spurious commands stopped. Slung on by Jupiter, Pioneer 11 arced high above the solar systems ecliptic plane and raced toward its appointment with Saturn on 1 September 1979, at that time 1.6 billion kilometres from Earth. In cruise mode Pioneer 11 now kept on studying the solar wind and interplanetary medium, but from outside the ecliptic plane. The path taken by Pioneer 11 from Jupiter up above the ecliptic and back down again for the Saturn encounter. Debates raged on where Pioneer 11 was going to pass by Saturn  inside the rings, or outside the rings. 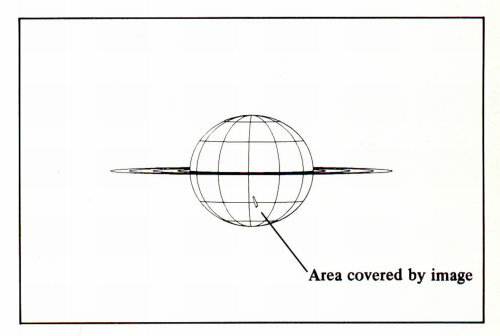 The more daring trajectory would take Pioneer 11 inside the rings, with closest approach about halfway between the cloud tops and the innermost edge of the main rings. This was a relatively dangerous area, because there was known to be at least one faint ring inside the main ones. The estimated probability of spacecraft survival ranged from over 99% to under 1%, depending on whose ring-density model you believed. The advantage was a unique opportunity to observe Saturn and its magnetosphere up close. However, losing the spacecraft would considerably reduce the data return. After a long debate, the principal investigators who ran Pioneers instruments voted 11 to 1 in favour of the inside mission. The more conservative outside plan specified two ring-plane crossings, both well outside the visible rings. The chosen distances for the crossings matched the flyby distance needed for Voyager 2 if it were to reach Uranus. The Voyager planners, given a unique and irreplaceable opportunity to visit two more planets, badly wanted to know if that distance presented any risks to their spacecraft. Such a flyby was also much safer for Pioneer 11, assuring experiment data would continue after the ring-plane crossing, and also providing for a continued mission into deep space. The final decision was made at NASA Headquarters in Washington: using Pioneer 11 as a pathfinder for the Voyager Uranus-Neptune mission was more important than getting maximum return from the Pioneer 11 flyby alone. 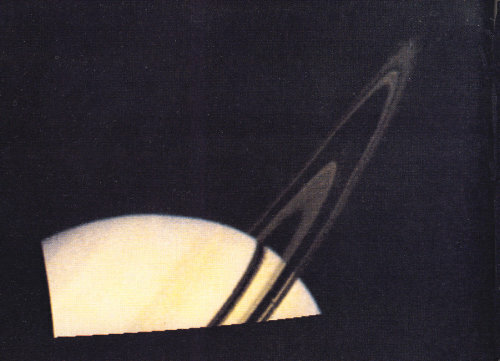 Although very poor quality by Voyager and Cassini standards, when this picture came out in 1979 we were all very excited as it was the first time we had an image of Saturn that exceeded the best Earth-based telescope pictures. It was taken by Pioneer 11 on 29 August 1979 from a distance of 2.5 million kilometres, 58 hours before PCA. The rings have a different appearance than Earth-based pictures because the rings are illuminated from below rather than from above, which means we see incoming sunlight rather than reflected from the particles. If the particles in the rings are too dense, the sunlight cant get through so that ring is very dark, or black. The moon seen below the planet is Rhea, about half the size of Earths moon. Pioneer 11 would take the safer outside trajectory. Taken on 31 August 1979 at 1657 UT (0257 1 September AEST) from a distance of 1.25 million kilometres, this picture shows the major features of the rings and planetary cloud belts of the northern hemisphere of Saturn. Saturns magnetic field and its associated magnetosphere was one of the primary interests of the scientists. Most expected Saturn to have a magnetic field, but guessed it would be half the size of Jupiters. From 30 August the scientists manned their posts, 2 days before encounter, looking for signs of any bow shock. Six key retirees from the project, known affectionately as the over-the-hill gang, returned to work for this critical period. Unfortunately at this point the Sun decided to burst into a high activity period creating three problems for the scientists. First a stronger solar wind arrived to push Saturns magnetosphere in towards the planet. Second an energetic particle event on the Sun affected the distribution of particles inside the planets magnetosphere, masking any energetic particles that might be expelled from it. Lastly, the Pioneer 11 signals had to pass near the Sun, the increased activity of the solar wind threatening to interfere with the signals being sent to Earth. As a precaution, the mission controllers reduced the telemetry rate from 1024 bits per second to 512 bits per second for the ring passage. Expecting the bow shock to be about 4 million kilometres plus from the planet, the scientists began looking for it all night and into the morning of the 31st of August, watching the data from the particle and fields instruments, but there were no signs. Then at 2300 AEST 31 August, at a distance of 1.446 million kilometres, the first signs of a bow shock appeared in the data, proving that Saturn did have a magnetic field. One and a half hours later a collapsing magnetosphere passed back over the spacecraft as the Suns solar wind power increased, and Pioneer 11 ploughed through the bow shock again at 0500 AEST 1 September, then again at 1000 AEST, 1.026 million kilometres from the planet. This placed the moon Titan outside the magnetosphere, but as the Suns activity was high, scientists decided that Titan would normally be inside the magnetosphere. Two hours before closest approach the imaging photpolarimeter obtained the most detailed pictures, with a resolution of 80  100 kilometres. Once below the rings Pioneer 11 was moving too fast and was too close to the rings and planet to get high resolution pictures. However, a low resolution picture was obtained from the polarization data. This is the closest and highest resolution picture of the clouds of Saturn  taken on Saturday 1 September 1979 at 1440 UT (0040 2 September AEST) from a distance of 251,000 kilometres. The aperture size is 250 kilometres. This picture of the bland, uninteresting surface of Saturn clearly demonstrates the difference between the atmospherics of Jupiter and Saturn. The diagram at right shows where the view of the closest picture of Saturn was taken. The first crossing of the ring plan occurred at 0036 AEST 2 September 1979, the spacecraft hurtling past at 112,000 kilometres per hour. The mission controllers went quiet during this period as the countdown was broadcast across America on radio and television. 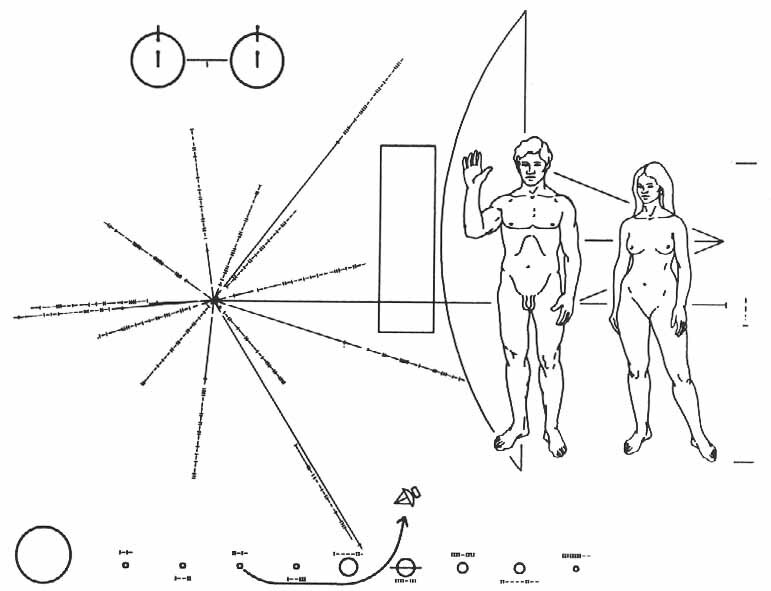 As the signal was still being received by Goldstone at 0330 AEST Charlie Hall, the Project Manager, felt it was safe to announce that Pioneer 11 had safely passed the ring plane, and the controllers breathed again. Pioneer 11 at Saturn. The spacecraft crossed the ring plane once inbound, and once outbound, both at the same distance from the planet. Point of Closest Approach (PCA) took place below the ring plane in the southern hemisphere of Saturn, before skipping past Titan at a distance of 353,950 kilometres. A few minutes after the ring plane crossing, as the spacecraft flew across the region between the orbit of Mimas and the F Ring, it nearly collided with a very large object. The counting rates on the energetic particle and fields detectors suddenly and dramatically dropped for about 10 seconds, accompanied by changes in the magnetic fields. Apparently the spacecraft had passed right through the magnetic wake of a moon. From the duration of the signal dropout and speed of the spacecraft, scientists estimated the diameter of the object was about 170 kilometres, and the miss distance was at least several thousand kilometres. With its orbit inside that of Mimas, this new moon was called 1979S2. After the first ring crossing, Pioneer 11 flew along 2,000 to 10,000 kilometres beneath the rings, and about 38,000 kilometres clear of the known outer ring. At 0931 USPDT 1 September (0231 AEST 2 September) the spacecraft flew to within 20,930 kilometres of the cloud tops (1.35RS) of Saturn, travelling at 114,150 kilometres per hour, and took five images, but it was travelling too fast to record the first ever detailed close-up pictures of the ringed planet. 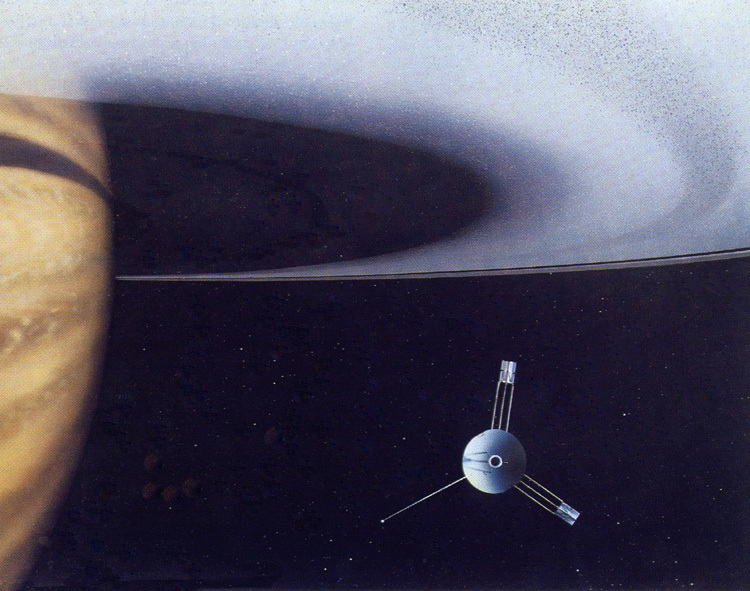 An artists impression of Pioneer 11 speeding along under the Rings at PCA, the Point of Closest Approach to Saturn. One minute after PCA the signal was cut off as the spacecraft went behind the planet, and did not return until 0350 AEST, then it crossed the ring plane again at 0435. Of course, none of these events were being monitored in real time back on Earth, as it took 86 minutes for the signal to reach us. 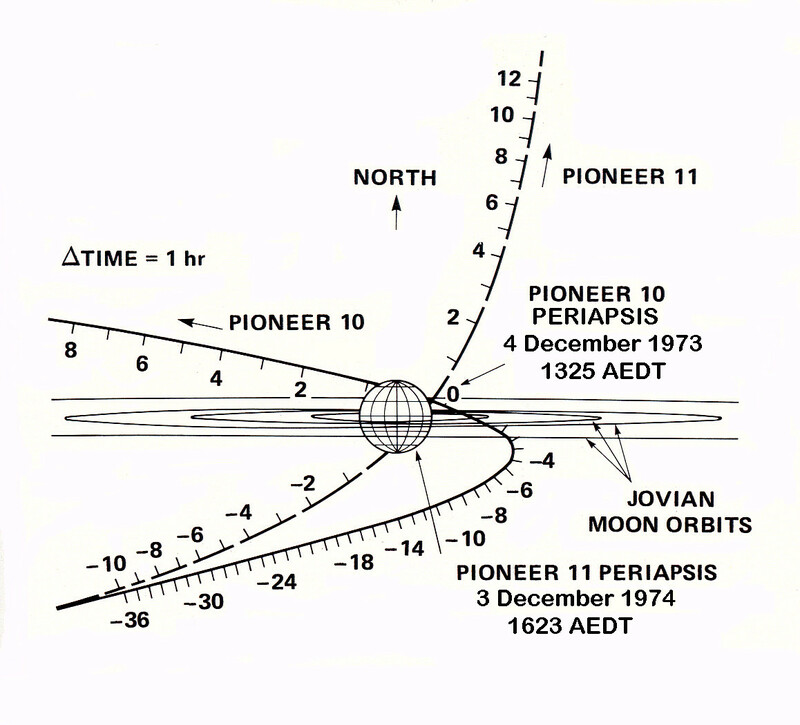 It was 1801 AEST of 2 September in Australia before Earthlings knew that Pioneer 11 had been successful. The meteoroid detector registered two hits on the way in, another at PCA, and two more as it flew below the rings behind the planet. These days it is easy to accept the successful flyby of Pioneer 11, but it really was an incredible feat of navigation to produce these results with no previous experience to call on. To steer the spacecraft so accurately down the chosen path after a 6½ year flight over a distance of 3.2 billion kilometres, was an awesome accomplishment by any standards. On 3 September at 0404 AEST Pioneer 11 made its closest approach to Titan at a distance of 353,950 kilometres, and managed to take five rather fuzzy images, too far away to resolve any details of the moon. The telemetry bit rate was increased to 1024 bits per second for the Titan encounter. After leaving Saturn behind, Pioneer 11 passed the moon Titan at a distance of 360,000 kilometres on 2 September 1979 at 1848 UT (0448 3 September AEST). The spacecraft took five images from which was constructed this picture of Titan. Titan had never before been seen from this aspect and close range, but because of the distance from the spacecraft no surface details can be detected, though scientists said that the moon seemed to be covered by clouds. The first pages of the secrets of this mysterious moon of Saturn were opening up. The later missions of Voyager and Cassini/Huygens were to reveal a lot more, the European probe Huygens landing on the surface on 14 January 2005 and sending back some remarkable pictures. During the encounter some 15,000 commands were sent to the spacecraft. By 4 September Pioneer 11 was leaving Saturn at 36,210 kilometres per hour, but the Suns noise was increasing, so that even at 512 bits per second 25% of the data was being lost. On 6 September the bit rate was dropped down to 32 bits per second while the spacecrafts signal skimmed the edge of the Sun on its way to the tracking stations on Earth. There are two similar-sized moons, the tenth and eleventh satellites of Saturn, named 1979S1 (now 1980S1) and 1979S2 (now 1980S3) in the same orbit, and there is still some uncertainty about just which one was the object of Pioneers near-miss. 1979S2 (1980S3) was discovered in an image taken by Pioneer 11 of the outer edge of the rings. Its diameter was estimated as 400 kilometres, but has been revised by Voyagers visit to 100 by 140 kilometres. That Saturn has a magnetic field, magnetosphere and radiation belts. Two new rings were identified. One is the F Ring, separated from the A ring by a 3,600 kilometre gap, now called the Pioneer Division. A second ring, the G Ring, was also discovered and lies between the orbits of the moons Rhea and Titan, about 500,000 kilometres from Saturns cloud tops. A feature called the French Division was found between the B and C rings, spotted in Pioneer pictures of the shadow of the rings on the planets surface. Substantial particle material was seen in Cassinis Division, and in the outer and inner portions of the A ring. Cassini looks empty when viewed from Earth. The B ring was so opaque that very little light was seen to pass through it. 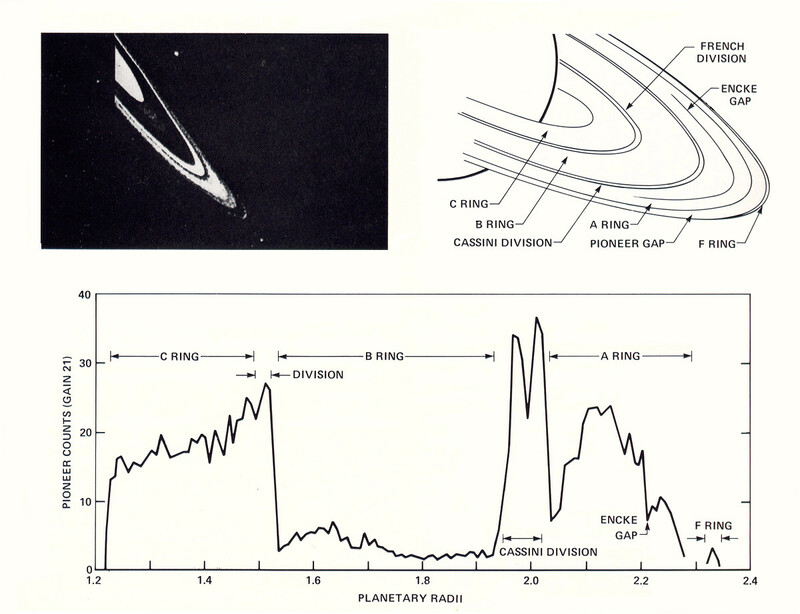 The C ring was found to have few particles and appeared as diffuse as Cassinis Division. Pioneer found no evidence of either an innermost D ring, or the expected outer E ring. This picture (on the right) by the imaging photopolarimeter was derived to show the transmission of red light through the Rings. The left diagrams show how a radial intensity profile was made of 5 pixel azimuthal averages for each point plotted. 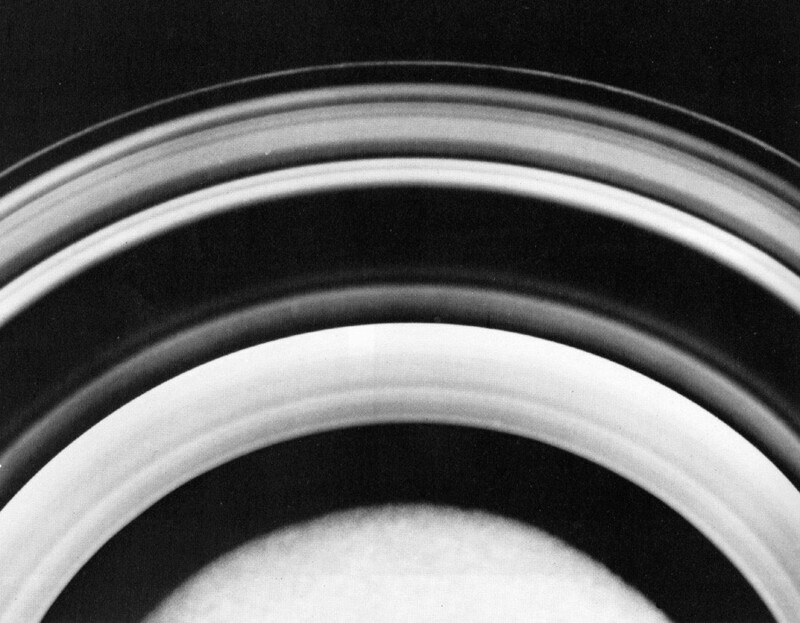 Then this intensity profile was swept over a photographic film to produce this synthetic image to show the various rings, divisions, and gaps looking from above the north pole of Saturn on 1 September 1979. Preliminary measurements of the ring mass indicate they have a low density, inferring they are made up largely of ice particles. A substantial glow of atomic hydrogen was found around the rings, which suggested absorption of protons from the radiation belts causing dissociation of water in the rings. Gravity field measurements indicate that Saturn is flattened about 10% at the poles by its rapid rotation, with a depression at the mid-latitudes of about 120 kilometres. Improved gravity coefficients for Saturn, its satellites and rings were calculated on the basis of a combination of Pioneer 11 spacecraft Doppler tracking data and earth-based determinations of Saturn natural satellite apse and node rates. Solutions were first obtained separately from the coherent Doppler tracking data obtained for the interval from August 20 to September 4, surrounding the time of closest approach, with the effects of solar plasma on radio signal propagation taken into account. 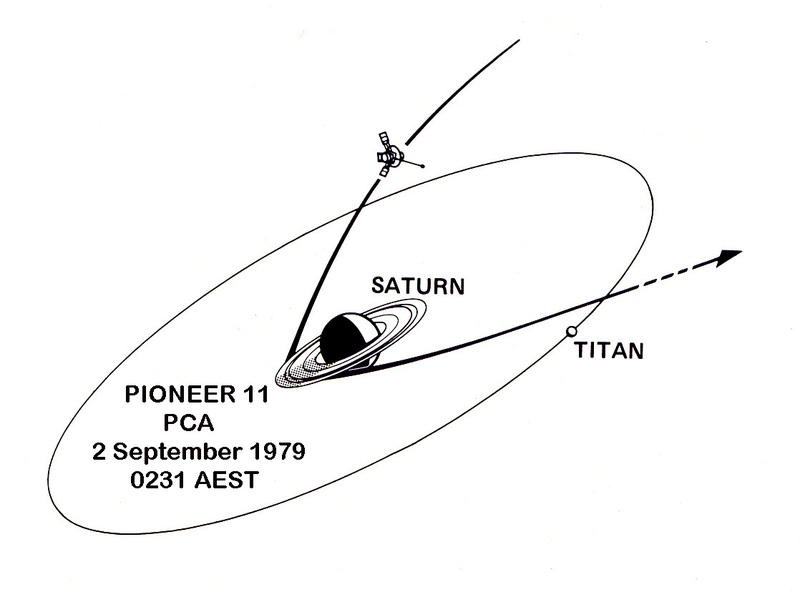 As Pioneer 11 left Saturn on its outbound trajectory, it saw the planet in a crescent phase for the first time. Never before had anyone seen the planet with its rings from the other side. There is little atmospheric belt structure visible because of the forward scattering of sunlight by a thin, high-level haze, though they did become marginally more visible and the shadows from the Rings became narrower as the spacecraft moved away from the planet. Following its encounter with Saturn, Pioneer 11 explored the outer regions of our Solar system, studying energetic particles from our Sun (Solar Wind) and cosmic rays entering our portion of the Milky Way. In September 1995, Pioneer 11 was at a distance of 6.5 billion kilometres from Earth. At that distance, it takes over 6 hours for the radio signal (travelling at the speed of light) to reach Earth. By September 1995, Pioneer 11 could no longer make any scientific observations. On 30 September 1995, routine daily mission operations were stopped and the Pioneer 11 Mission was officially ended. Intermittent contact continued until November 1995, at which time the last communication with Pioneer 11 took place. The Earths motion has carried it out of view of Pioneer 11s antenna, so the spacecraft cannot receive commands from Earth to be manoeuvred to point back at the Earth. It is not known whether the spacecraft is still transmitting a signal. No further tracks of Pioneer 11 are scheduled. The spacecraft is headed toward the constellation of Aquila (The Eagle), northwest of the constellation of Sagittarius. Pioneer 11 will pass near one of the stars in the constellation in about 4 million years. As for the life of these spacecraft, all the wear, pitting, and erosion that Pioneer 10 and 11 have sustained are probably over now. The asteroid belt and the severe conditions of Jupiter have already been experienced. Now, the Pioneers are in the vacuum of space where the average spatial density of molecules is one trillionth the density of the best vacuum we can draw on Earth. We expect the Pioneers to last an indeterminate period of time, in simple language - forever. They will probably outlast their home planet, as in 5 billion years the Sun will become a red giant as its fuel is exhausted, and expand to consume the Earth. The Pioneers will probably still be out there coasting through interstellar space. Erosional processes in the interstellar environment are largely unknown, but are very likely less efficient than erosion within the solar system, where a characteristic erosion rate, due largely to micrometeoritic pitting, is of the order of 1 Angstrom per year. Measured from its farthest ends, from the horn of the medium-gain antenna to the tip of the omnidirectional antenna, the Pioneer spacecraft is 2.9 meters long. Its widest cross-wise dimension, exclusive of the booms, is the 2.7 metre diameter high gain antenna. The Pioneer twins each weighed 258.5 kilograms on Earth. The spacecraft were spin-stabilized, spinning about the axis of the high gain dish antenna at 4.8 revs per minute. Six Hydrazine thrusters provided velocity, attitude and spin-rate control. Electrical power was provided by four radioisotope thermoelectric generators (RTGs), each providing 40 watts of power at launch. Two, three-rod trusses, 120 degrees apart, project from the equipment compartment to deploy the RTG power sources about 3 metres from the centre of the spacecraft. A third boom, 120 degrees from the others, projects from the experiments compartment and positions the helium vector magnetometer sensor 6.5 metres from the spacecraft centre. From over 150 original proposals, Pioneer 10 finally carried eleven experiments, while a fluxgate magnetometer was added to Pioneer 11 to make it twelve. 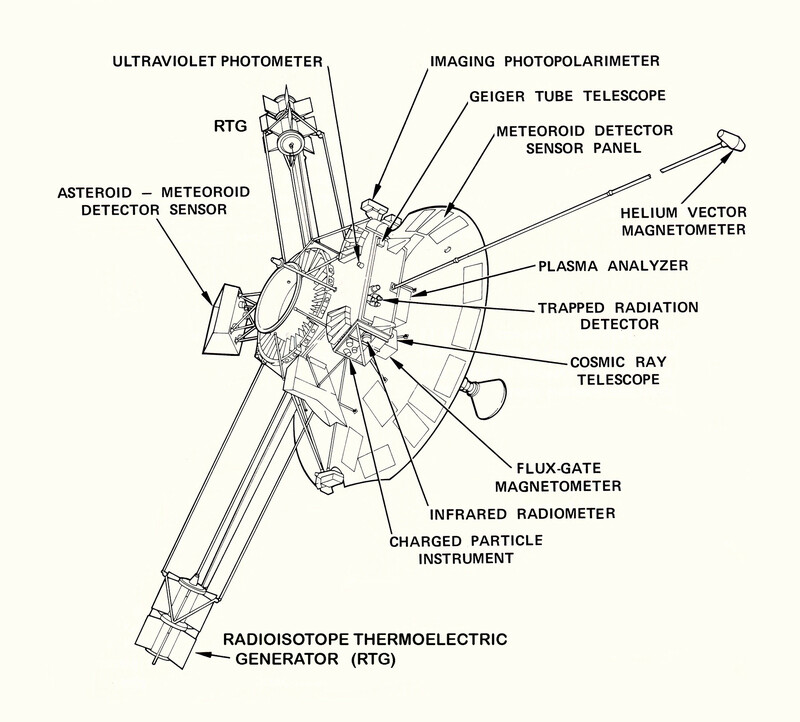 The following is a rundown of scientific instruments on board the Pioneer 10 and 11 spacecraft. 1. Helium Vector Magnetometer. Jet Propulsion Laboratory. This instrument measured the interplanetary magnetic field in three axes from the orbit of Earth out to the limits of the spacecrafts communication. The sensor is mounted on a lightweight mast extending 6.5 metres from the spacecraft to minimise interference from any spacecraft magnetic fields. The sensor consisted of a cell filled with helium that was excited by electrical discharges at radio frequencies and infrared optical pumping. Changes in helium absorbtion caused by magnetic fields passing through the magnetometer were measured by an infrared optical detector. It operated in any one of 8 different ranges, selected by Mission Control or automatically; from 2.5 gamma up to 140,000 gamma (the Earths surface field is 50,000 gamma). It can measure fields as weak as 0.01 gamma. 2. Fluxgate Magnetometer. Goddard Space Flight Center. Pioneer 11 only. This instrument was designed to measure the strength of intense planetary fields up to 1 million gamma in each of three perpendicular directions. It consisted of 2 dual-axis sensors, each composed of a ring core, magnetic multivibrator, frequency doubler and two-phase sensitive detectors. FOR MEASURING SOLAR WIND, BOW SHOCK WAVE AND MAGNETOSPHERE. 3. Plasma Analyser. Ames Research Center. The Plasma Instrument mapped the density and energy of the solar wind and looked for their interactions with the planets magnetosphere. It consisted of a high resolution and medium resolution analyser to detect particles of different energy levels. It looked toward the Sun through an aperture in the dish antenna and collected the solar wind like the electron beam in a television tube. The only instrument on the spacecraft capable of looking directly at the Sun without damage, it measured the solar winds direction of travel, energy, and counted the numbers of ions and electrons. The high resolution analyser has 26 continuous-channel multipliers (CCM) which measured the ion flux in energy ranges from 100 to 8,000 electron volts. The medium range detector has 5 electrometers, which measured ions in ranges from 100 to 18,000 electron volts, and electrons from 1 to 500 electron volts. In the early stages of the flight, the Plasma Analyser was the only instrument able to look directly at the Sun, the others could not be exposed to direct sunlight without serious damage, so when the bright Sun illuminated the spacecraft from the side some of the instruments were left powered down, or sunlight screens were used. Pioneer 10 had some heating problems for several weeks after launch, so the spacecraft was commanded to point slightly away from the Sun so the shadow of the dish antenna shielded vulnerable parts such as the batteries. All the science instruments of Pioneer 10 survived the stresses of launch. FOR MEASURING RADIATION BELTS AND COSMIC RAYS. 4. Charged Particle Composition Instrument. University of Chicago. This instrument has a family of 4 measuring systems. Two are particle telescopes primarily for interplanetary space and two measured trapped electrons and protons in planetary radiation belts. During interplanetary flight the first two telescopes identified the chemical elements hydrogen, helium, lithium, beryllium, boron, carbon, nitrogen and oxygen. It also separated hydrogen, deuterium, helium-3 and helium-4 particles to differentiate between those coming from the Sun and those coming from the galactic void. The main telescope of seven solid state detectors measured the composition of cosmic rays from 1 to 500 million electron volts, and a three element, low energy telescope measured 0.4 to 10 electron volt protons and helium nuclei. For strong magnetospheres expected near the planets two new types of sensors were installed to cope with the extremely high intensities of trapped radiation. A solid-state electron current detector operating below minus 40°C measured electrons above 3 electron volts that generated the decimetric radio waves from Jupiter. The trapped proton detector contained a foil of thorium, which undergoes nuclear fission when impacted with protons above 30 million electron volts, but is insensitive to electrons. 5. Cosmic Ray Telescope. Goddard Space Flight Center. This instrument monitored the solar and galactic cosmic ray particles. It tracked the twisting paths of high energy particles from the Sun and measured bending effects of the solar magnetic field on particles from the galaxy. This instrument distinguished which of the 10 lightest elements make up these particles. This instrument consists of 3 three-element, solid-state telescopes. A high energy telescope measures the flux or protons between 56 and 800 million electron volts. A medium energy telescope measures protons with energies between 3 and 22 million electron volts, and identifies the 8 elements from Helium to Oxygen. The low energy telescope studies the flux of electrons between 50,000 electron volts to 1 million electron volts and protons between 50,000 electron volts and 20 million electron volts. 6. Geiger Tube Telescopes. University of Iowa. This instrument measured the planets radiation belts. It employed 7 Geiger-Müller tubes to survey the intensities, energy spectra and angular distributions of electrons and protons along the radiation belts of Pioneers flight path. Each tube has a small gas-filled cylinder. When a charged particle passes through the gas, an electrical signal is generated. Three parallel tubes form a telescope, three others form a triangular array to measure the number of multi-particle events called showers. The combination of telescope and shower detector compares primary and secondary events in the planetary radiation belts. The third telescope detected low energy electrons above 40,000 electron volts. The instrument also counted protons with energies above 5 million electron volts and electrons with energies between 2 and 50 million electron volts. 7. Trapped Radiation Detector. University of California, San Diego. An unfocussed Cerenkov counter measured the direction of particle travel by light emitted in a particular direction, detecting electrons of energy above 1 million electron volts and protons above 450 million electron volts. A second detector measured electrons at 100,000 electron volts, 200,000 electron volts, and 400,000 electron volts. An omnidirectional solid state diode counter which discriminated between minimum ionising particles at 400,000 electron volts and high energy protons at 1.8 million electron volts. Two direct current scintillation detectors for low energy particles to distinguish between protons and electrons because of different scintillation material in each. Their energy thresholds were about 10,000 electron volts for electrons, and 150,000 electron volts for protons. TO MEASURE DUST, METEOROIDS AND INTERPLANETARY DUST. 8. 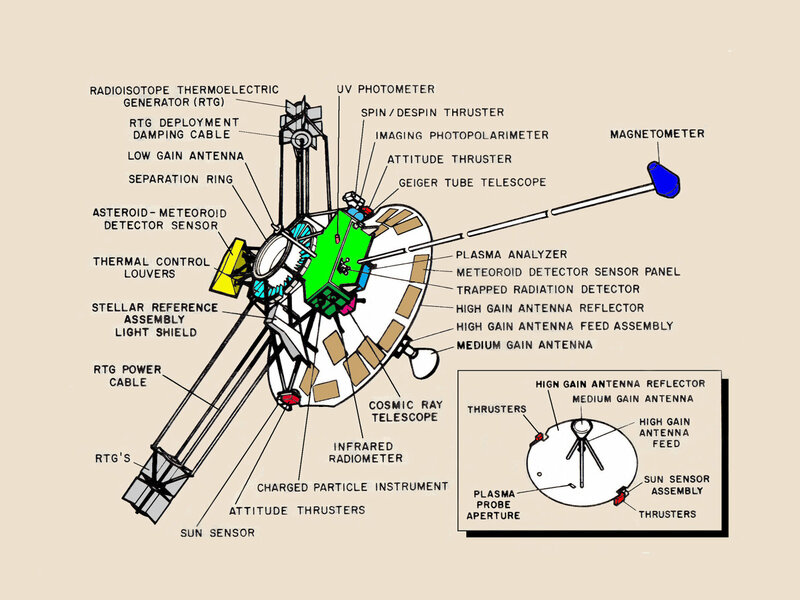 Asteroid/ Meteoroid Detector (Sisyphus). General Electric Company. This instrument was supposed to survey the solid material between the Earths orbit out to 2.4 billion kilometres. It was labelled Sisyphus because of its almost impossible task (Sisyphus was a mythical Corinthian king, whose job in Hades was to roll a stone up a hill, only to have it roll back forever). By measuring the orbits of material in the vicinity of the spacecraft, the scientists had hoped to learn about the origins of meteoroids, asteroids and comets as well as their distribution in the solar system. It consisted of 4 non-imaging telescopes with an 8° view cone that detected sunlight reflected from these particles or bodies passing through their fields of view. Each telescope had a 20 centimetre diameter primary mirror, an 8.4 centimetre secondary mirror, coupling optics and a photomultiplier tube that converted light to electrical signals. If a particle, varying in size from a nearby dust particle to a many kilometre-sized asteroid, was detected by any three of the telescopes an event was recorded. From the data, the particle or bodys distance, trajectory, velocity, and relative size could be calculated. Unfortunately in Pioneer 11 this instrument was overwhelmed and knocked out by the intense radiation belts during the Jupiter encounter, and was turned off in 1975. 9. Meteoroid Detector. Langley Research Center. To detect the distribution of particles (with masses of about 100 millionth of a gram, or greater), scientists used a system of 234 pressure cells mounted on the back of the spacecraft dish antenna. The cells were contained in six 30 x 30 centimetre panels, each containing 18 cells, with a total area of 0.605 of a square metre. Each pressure cell was filled with a gas mixture of 75% argon and 25% nitrogen. The cell walls were made of stainless steel, thin enough to allow penetration of particles with a mass of about 1 billionth of a gram, or more. When a particle penetrated a cell it emptied it of gas, the loss rate being proportional to the size of the hole. A transducer noted this, counting one particle impact per cell. TO MEASURE PLANETARY ATMOSPHERES, TEMPERATURES, AND INTERPLANETARY HYDROGEN, HELIUM AND DUST. 10. Ultraviolet Photometer. University of Southern California, Los Angeles. By measuring the scattering of the Suns ultraviolet light, this instrument can measure amounts of neutral hydrogen in the heliosphere, as from radio telescope measurements the whole solar system is understood to be immersed in an interstellar gas of cold neutral hydrogen. Also, neutral helium may penetrate the solar system as it moves through the interstellar gas at 72,000 kilometres per hour. During the planetary encounters the Ultraviolet Photometer measured the scattering of ultraviolet light from the Sun by Jupiter, Saturn, Titan, and other moons and rings in two wavelengths  one for Hydrogen and one for Helium. This data was also used to find the amount of atomic hydrogen in the planets upper atmosphere, the mixing rate of the atmospheres, and the ratio of helium to molecular hydrogen. This instrument has two photo cathode detectors, one measuring ultraviolet radiation at 1216 Angstroms, the other at 584 Angstroms  wavelengths at which hydrogen and helium scatter solar ultraviolet light. This instrument only had one fixed viewing angle and used the spacecraft spin to scan a planet. By measuring changes in the ultraviolet light glow, the instrument also checked to for planetary polar auroras. PICTURES, ATMOSPHERES, AND MOON SURFACES. 11. Imaging Photopolarimeter. University of Arizona, Tucson. This instrument provided data in 3 different modes, mainly differing in sensitivity and instantaneous field of view. In the earlier days of the mission the most sensitive was used to study the Zodiacal light, Gegenschein, and integrated starlight from the galaxy. Pioneer confirmed the Gegenschein was still visible from as far away as Mars. This mode wasnt used at encounter. The other two modes used photometry (measurement of light intensity), and polarimetry (photometry measurements of the linear polarisation of light), over a wide range of phase angles and distances to provide information about the size, shape, and refractive indices of planetary cloud particles. How the Imaging Photopolarimeter (IPP) system scanned a planet to produce an image. 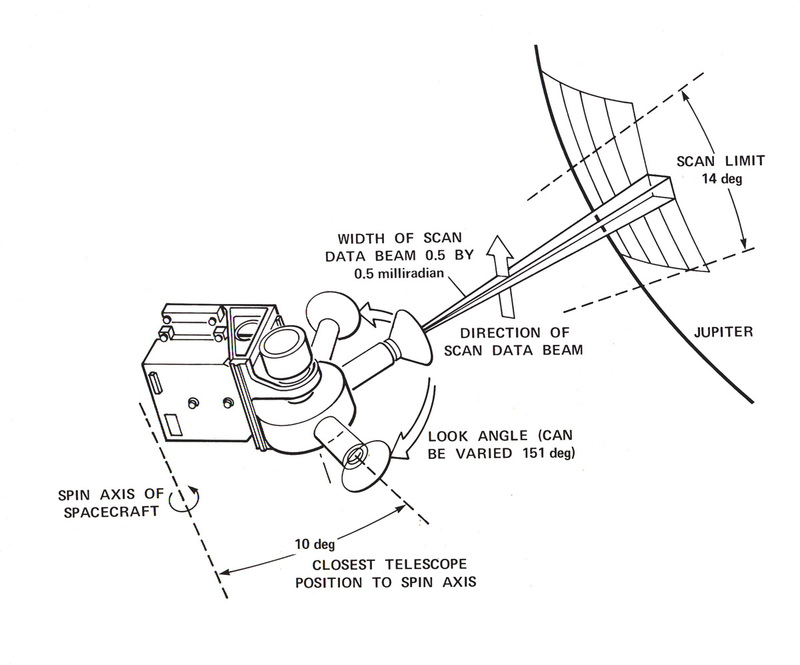 The horizontal scan lines were produced by the 4.8 rpm spin of the spacecraft, while the vertical scan lines were set by the instruments telescope stepping 0.5 milliradians with respect to the spin axis between each rotation of the spacecraft. HOW THE PICTURES WERE PRODUCED. 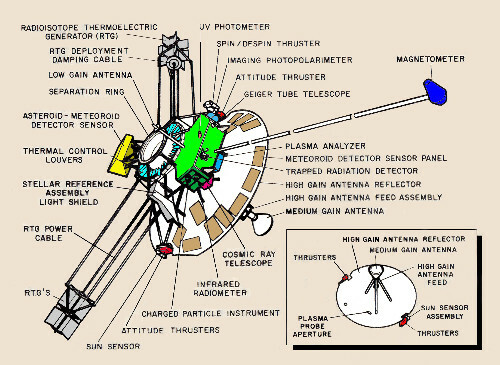 The Pioneer spacecraft did not have photographic imaging cameras, as the later Voyager spacecraft did, but derived pictures of the planets from the Imaging Photopolarimeter (IPP). The optical system consisted of a 2.54 centimetre diameter Maksutov type telescope; a calcite Wallaston prism polarisation analyser; multi-layer filters to separate red and blue components of the reflected light from the planet; relay optics; and two dual, continuous channel multiplier detectors each designed to sense two polarisation components in one of two colours (a total of four channels). Analog signals from the detectors were digitised, buffered in the spacecrafts data storage unit, and transmitted to Earth in either of two telemetry formats. After a command to initiate a reading had been received, the electronic logic processor automatically provided all the internal commands to sequence a complete measurement function, store the results, and return the instrument to standby. Relying on the 4.8 rpm axial spin of the spacecraft to sweep the telescope across the surface of the planet in 0.03° wide swathes in red and blue filters, in the imaging mode the data was converted to 64 levels of intensity (6 bits) and stored in a 6144 bit buffer. The IPP overwrote this buffer as it started each vertical scan with each rotation of the spacecraft. The memory read-in time was half a second and the spacecraft rotation period was 12.5 seconds, which meant there were approximately 12 seconds available to access the data in memory. To read out the 6144 bits in the 12 seconds required a data rate of 512 bits per second. This instrument measured the strength of sunlight scattered from the clouds of the planet under observation and converted this information into digital representations of different shades of red and blue. This information was transmitted to Earth as part of the telemetry signal. Computers at Ames converted this data into patterns of light and dark on to photographic film, which eventually resulted in a picture. TO MEASURE ATMOSPHERES, IONOSPHERES, AND TEMPERATURES. 12. Infrared Radiometer. California Institute of Technology. This instrument measured the net heat energy emitted by Jupiter, Saturn and Titan as well as the vertical and horizontal temperature measurements in the planetary atmospheres as well as a rough measurement of the atmospheres hydrogen/helium ratios. The two-channel radiometers took measurements in the 14-25 and 29-56 micron wavelength regions to study the net heat energy flux; its distribution and the thermal structure and chemical composition of the planetary atmospheres. In addition to the 11/12 on-board experiments, there were two experiments using the spacecrafts signals to the tracking stations. CELESTIAL MECHANICS AND OCCULTATION EXPERIMENTS. Celestial Mechanics Experiment. Jet Propulsion Laboratory. This experiment used the spacecraft itself as a sensitive instrument to determine the mass of the planets and their moons and to calculate any harmonics and anomalies of their gravity fields, as well as their surface layers and deep interiors. The two-way Doppler tracking data, augmented by optical and radar position data were used to determine the mass of the planets from perturbations of the paths of the spacecraft as they passed behind the planets. The spacecrafts velocities were known down to a fraction of a millimetre per second every minute. 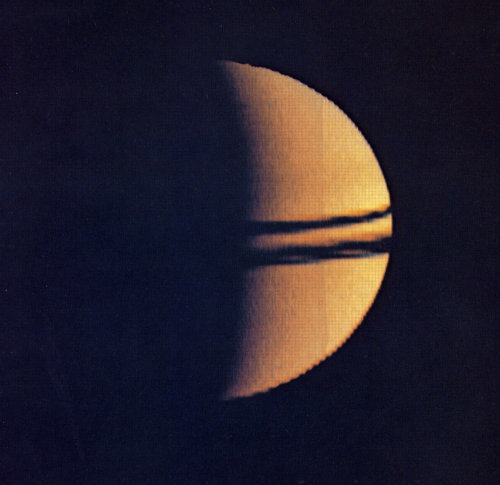 Computer calculations, based on the spacecrafts trajectories and known planet and moon orbital characteristics, provided a five-fold improvement in the accuracy of the two planets masses. At Jupiter, masses of the four largest moons (Io, Europa, Ganymede, and Callisto) were determined to an accuracy of one percent. The experiment also determined the polar flattening of Jupiter to within 0.8 of a kilometre. S-Band Occultation Experiment. Jet Propulsion Laboratory. The radio signals from the spacecraft were used to probe the atmospheres of Jupiter and Saturn. Passage of the spacecrafts S-Band signals through the atmospheres for about an hour as the Pioneers swung behind the planets probed the atmospheres and provided information on the densities to a pressure level of about one Earth atmosphere. Similar analyses had been made from Earth with the light of stars occulted by Jupiter and Saturn, but Pioneers S-Band telemetry signals were a more precisely known signal source so provided a much higher order of accuracy. Refraction of the signal provided measurement of the electron density of the planets ionospheres. Used in conjunction with temperature measurements, inferences were made about the hydrogen/helium ratios of the atmospheres. Scientists were also able to measure the absorption profile of the planets abundance of ammonia. During the testing phases of the Pioneer spacecraft a group of media science correspondents were gazing at Pioneer 10 gleaming under the light of an artificial Sun in a space simulator at TRW Systems in California. One of the group, Eric Burgess, from the Christian Science Monitor, began to realise this spacecraft would become a human messenger from planet Earth  perhaps we should have some sort of message on it. He mentioned the idea to Richard Hoagland, a freelance writer, and Don Bane, a journalist with the Los Angeles Herald-Examiner. Burgess and Hoagland approached Dr Carl Sagan, at the time visiting JPL from Cornell University, and put their idea forward. As Sagan was involved with SETI, having just attended a conference devoted to the problems of communicating with extraterrestrial intelligences, he was enthusiastic about the idea, so he and Dr Frank Drake, Director of the National Astronomy and Ionosphere Center, designed a plaque, and Linda Sagan prepared the artwork. It was presented to NASA and accepted. The final drawing was etched into a gold-anodised aluminium plate 15.25 x 22.8 centimetres and attached to the antenna support struts. The plaque tells of we humans, and where we are located in the Cosmos. At the top left is a schematic of the hyperfine transition of neutral atomic hydrogen  a universal yardstick  providing a basic unit of both time and physical length throughout the Universe. 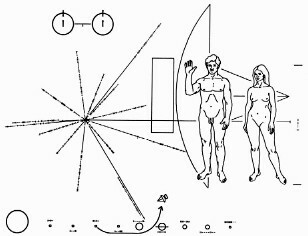 As a further check of size, the binary equivalent of the decimal number 8 is shown between tote marks indicating the height of the two human figures to be compared with the scale of the spacecraft itself, which is shown as a line silhouette on the plaque. The hydrogen wavelength  about 20.32 centimetres  multiplied by the binary number representing 8 alongside the woman gives her height; 162.56 centimetres. The radial pattern on the left of centre represents the position of our Sun relative to 14 Pulsars and to the centre of the Galaxy. The latter direction is indicated by the long horizontal line with no binary digits on it. The binary digits on the other lines represent time. This can be deduced because they represent precision to 10 decimal digits, which is unlikely for distances to stellar objects but quite feasible for measurements of time. From the unit of time established from the hydrogen atom, the extraterrestrial intelligence should be able to deduce that all times are about one tenth of a second ......... i.e. Pulsars. Since the periods of Pulsars run down at well established rates, they act as galactic clocks. It is supposed an advanced civilisation would be able to search its records and identify the star system from which the spacecraft originated, even if one of the Pioneers is not intercepted for several billions of years. Below the orientation diagram there is a diagram showing relative distances of the solar planets and identifying the ringed planet Saturn and the planet from which the spacecraft originated. After accelerating past the largest planet (Jupiter) the spacecraft is drawn with its antenna pointing back to its origin on the third planet from the Sun. 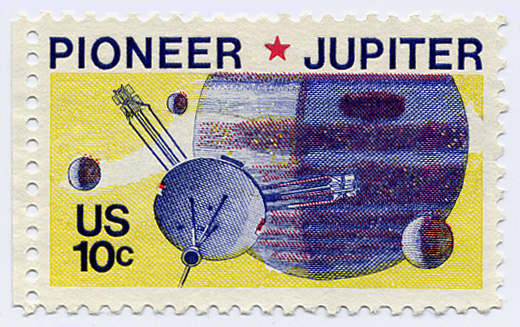 This stamp was produced to commemorate the visit of the Pioneers to Jupiter. Scan: Hamish Lindsay. Click for a larger version. Unless noted, all images used here are courtesy of NASA. Some modified by Hamish Lindsay.